This is the party trick of the pilot of this Yak 52 aircraft. After completing his aerobatic display he performs a "burn out." It is achieved by injecting oil into the hot exhaust pipes. Very spectacular without burning rubber. 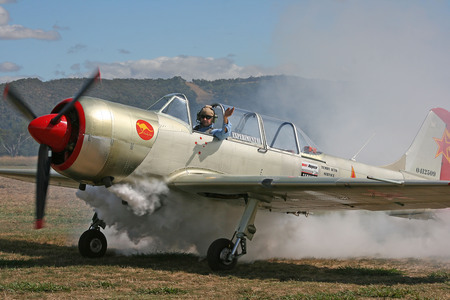 The photo was taken at a Lilydale Airfield airshow.